EXECUTIVE ACCESS: Guests staying at this 360 Blue property have access to limited golf tee times at Shark's Tooth and Camp Creek Golf Courses, the tennis courts at Shark's Tooth Club and complimentary use of two kayaks or canoes for one hour per day. They also receive 20% off stand-up paddle boards at the WaterColor Boathouse. DETAILS: There’s nothing like having the Emerald Coast as your backyard. This 7-bedroom, 5-bathroom Gulf-front retreat features a private pool, patio, chef’s kitchen and blockbuster Gulf views.Take your morning coffee up to the 4th-floor crow’s nest and spend your day on the sugar-white sands of Miramar Beach. Afterward, hang out poolside with family and friends. There’s plenty of room. 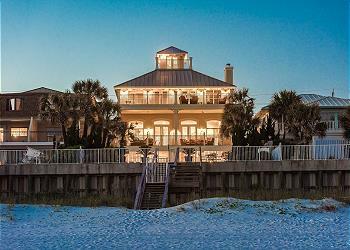 This Miramar Beach mansion sleeps 30! The first floor offers two guest bedrooms, a master bedroom and game room with a wet bar. It also features direct access to the private pool and the beach itself. A gorgeous staircase leads to the second floor, the focal point of the home. A chef’s kitchen has select stainless appliances including a gas range, granite counters and designer cabinets. Stunning Gulf views – even from here – make this a great place to visit with friends while preparing a meal. A dining area offers seating for 10, while the kitchen counter has seating for an additional 3. The living room features a gorgeous fireplace and a flat-screen television. Just down the hall is a guest bedroom. A balcony overlooking the Gulf is a great place to relax with cocktails. The staircase leads to the third floor where you’ll find a spacious second living area with a flat-screen television over a fireplace – the perfect place for a movie with family and friends – and balcony access with stunning Gulf views. Guests will also find two guest bedrooms and a master bedroom. The centerpiece of any Gulf-Front getaway is the Gulf itself, and “Casa Grande” offers a variety of settings to enjoy it. The location couldn’t be more convenient, with plenty of dining and shopping opportunities in the area, and the renown Destin Harbor just a short drive away. Contact 360 Blue to contact this Gulf-front gem today! We held a family get together at this home and couldn\'t have been more pleased with our accommodations. With 3 master suites there was plenty of room for couples and then extra rooms for kids and the singles among us. The beach is right out the back door and we spent most of our time either on the beach or in the pool or watching the water from one of the back porches. The house is beautiful inside and out with luxurious accommodations. We were able to cook meals in the kitchen which had everything we needed for big family meals. The staff at 360Blue were lovely to work with and answered all our questions and were good to check with us to make sure we had everything we needed I couldn\'t recommend Casa Grande more highly. We are so happy to hear that you enjoyed your stay in this beautiful home. It is truly a gulf front paradise and the perfect place for a family getaway. We look forward to having you back again soon! We are so glad you enjoyed this home for your vacation with us, and we hope to see you again soon! We are so glad that you enjoyed your stay with us in Miramar Beach! We are so sorry for the issues experienced during your stay but we are so glad that we were able to address them and make corrections in a timely and efficient manner. We are thrilled that your experience with 360 Blue was a positive one! We agree that this homes outdoor space is perfect for a relaxing and fun getaway and we hope to host you again very soon! We absolutely loved our stay at Casa Grande in Miramar Beach. It was a beautiful home and we had such a wonderful time. We loved everything about the home, the pool was wonderful and the location was perfect. We were a little frustrated trying to get enough room on the beach for my family without someone right on top of us, but the sand and water were amazing. Thank you for sharing your beautiful home with my family so that we could make amazing memories. We are so glad to hear how much you enjoyed your vacation with us in Miramar Beach! We agree that this home is in a wonderful location and having the pool is icing on the cake and what a wonderful family photo! We hope to host you and your family again soon! We loved the house for our four families. Our one complaint was that the house could have been cleaner when we checked in, especially the floors. Although we are thrilled to hear that you loved the house for all 4 families, we are so sorry that the cleaning was not up to standard when you checked in! If we get the opportunity to have you as our guest again, please don’t hesitate to call us and report any problems. In cases like this, our usual practice is to send a new cleaning crew out to correct the issues and make everything perfect. Again, we are very sorry you had some cleaning issues upon check in and we do thank you for the feedback! This home blew past all our expectations. We were in Destin for our son\'s wedding and could not have asked for a better choice or location. This amazing house is right on the beach, with outstanding views in all directions. As an added bonus, there is a Crow\'s Nest room that is reached by a metal spiral staircase where you can sit and read or have breakfast while taking in the most incredible sunrise/sunsets. There were plenty of well-appointed bedrooms and bathrooms and it seemed like there was a mini fridge, sink and microwave in each of the rooms. There were so many special touches with this home, including bikes and helmets for the guests to use. You can\'t go wrong by booking this and we are already planning our next trip. We are so thrilled to hear that you loved this amazing home as much as we do. We look forward to having you back soon! Beautiful home! We had an amazing family trip. More than enough room for 13 people. Couldn't get enough time on the beach and in the pool. Weather turned out great, concern with hurricane Harvey effecting trip and all we got was beautiful weather. The home is close to everything you would need even walking distance. The grown up kids had a blast on the bikes and the home was comfortable, clean and spacious. Looks like it was a beautiful day to spend at the beach! We are thrilled you enjoyed your vacation so much and that the weather held out for you! Thank you so much for staying with 360 Blue and we hope to have you back at the beach again soon! What a gorgeous day to spend relaxing at the beach! We are so happy you had such a great vacation in Miramar Beach! Thank you so much for staying with 360 Blue and we hope to have you back again soon! My Husband Robert and I decided to spend our 15th Wedding Anniversary here and enjoyed every minute of it! We enjoyed all the local restaurants and shopping. Most days were spent on the beach and poolside . What a gorgeous photo, it looks like a moment you will cherish forever! We are so pleased you loved the proximity of local shops and restaurants, as well as the fabulous private beachside pool. Thank you so much for taking the time to let us know how much you enjoyed your stay, we look forward to seeing you again in Miramar Beach! We spent a wonderful week making wonderful family memories in this home. The location was perfect, the view of the ocean was beautiful. We lived being right on the beach. The size of the pool was awesome for the kids. We had 16 people and the house was perfect. Thanks to the owners for renting such a great home. Will definitely try to come back!! What a fun photo! We love seeing those smiling faces, and are thrilled that you enjoyed making memories at the pool. Thank you so much for choosing to stay with 360 Blue, come see us again soon! What a beautiful photo! We are so thrilled you and your family enjoyed your stay so much! It is so nice to have the beach so close so you can enjoy the marine wildlife and finding sea shells and jellyfish! Thank you so much for staying with 360 Blue and we can't wait to have you back at the beach again soon! The beach house is beautiful. Great views, beautiful home and very convenient as the beach is just behind the house. We had an amazing time and made many family memories that will last a lifetime. Our family of 5 had so much fun! The house was very clean and we had no problems. I would recommend this beach home to anyone whether your coming as a family or with friends. Great place to stay!! Such adorable kiddos! We are thrilled that your family has such an amazing time in this beautiful home. We loved having you with us and look forward to having you all back soon! We can't begin to tell you how happy this makes us. We truly enjoy having you as a guest and appreciate your kind words. We look forward to having you back next year! Family Reunion of 22 from 7 States! This is a beautiful home, and the location was so perfect! Our family gathers for one week each year, from far and wide, to relax and enjoy each other -- and this was such a great place for 22 people ... EXCELLENT LOCATION 1) house right on beach ... very short, easy walk down to waterfront (minimal stairs, short distance across beach to water) 2) added perk: a city \"lifeguard stand\" located about 100 feet from our property\'s beachfront (great perk... felt so much safer as we floated in gulf) -- we noticed lifeguard stands are pretty far apart, so were glad one was right by us 3) huge variety of stores/restaurants less than a mile away (grocery stores, pharmacies, upscale shops) ... yet, we felt as if they were nowhere near us BEACH VIEWS - breathtaking! 1) a favorite activity -- watching sunrise/sunset from Crow\'s Nest (on top of house) 2) all decks have great views, comfortable furniture House is ideally located on the gulf -- views so relaxing and beautiful! POOL - Good layout: we like that there was both a (4-ft) shallow and a (9-ft) deep end + inside the pool, the bottom sloped upward at the sides (allowing us to \"stand\" rather than have to \"hold on\" to ledge) - water temperature & chlorine levels were perfect! We really liked the layout of the pool, both inside and out. KITCHEN - very nice layout and well-stocked with dishes and utensils. We cooked extensively for 22 people and totally enjoyed using the kitchen! DINING - enjoyed having 2 dining areas, plus were able to combine the tables in the main dining room to easily seat all 22 for dinner! BIKES - great fun - wonderful bike path right out front door (across street) FOOTWASH - never seen one like this (new invention?) ... it really worked GREAT! We had a few issues, but management was very attentive to address and take care of them. Prompt / great attitude. We appreciated the way they handled any and all concerns! We had a wonderful reunion, and were so glad we came to Casa Grande! We truly enjoyed having your family with us. What a wonderful way to bring the entire family together! We are so happy to hear that you loved this amazing home as much as we do. We hope to have you all back again soon! The property is located at an extremely convenient spot, & it had everything! But, for the price, the maint. & cleanliness was unsatisfactory. There were cigar/cigarette butts around the pool, many exterior & interior light bulbs were shot, some lights didn't work at all, the pool area needed to be blown off, the doors & molding need to be repainted, several window dressings were broken, the tubs were not clean, & the bathroom fixtures needed to be updated. The property mgt & cust. svc were very pleasant, but we notified them of the lights & they said "will try to get the contractor there" (not fixed during our stay). We paid an exorbitant price to stay at this house, & some simple things were just not done. There is no excuse for dirty tubs & busted light bulbs. The property mgt team needs a checklist & make sure simple things are done before guests arrive. Also, the constr. workers next door were noisy, stared at us in the pool, blocked garbage pickup & parking (had to speak to them directly a few times). Thank you for your valuable feedback. This is definitely not the experience that we want for our guests and we are working diligently to correct all of these issues. We know how frustrating nearby construction (and all of the things that come with it) can be. We are doing everything we can to work with those crews to mitigate these effect for our guests. We hope that you and your family had an amazing time while you were with us and made some memories that will last a lifetime. We have stayed here 3 consecutive years. We just love it. We had 16 people this year (4 families) and there is plenty of room. Our kids love the private pool and private beach and this year they added bikes so we took lots of bike rides. The elevator allows our kids the opportunity to enjoy a family vacation with their Papa who is unable to go up and down stairs. They had just started the construction next door when we got there and it did not disturb our sleeping at all, maybe because the beds are so comfy! :-) It is close to lots of wonderful shopping from little local shops to the big outlet mall and, of course, lots of wonderful places to eat, however, we spend a lot of nights cooking in because they just put in a new outdoor grill. 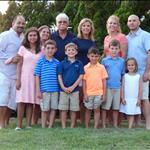 We also had 3 other families come over for dinner one night and we had plenty of room to accommodate all. Very thankful we found this place. This review makes us all happier than you can imagine. I can hear how much fun you had and that means the world to us. We are so glad that you found a place your entire family can enjoy. This home really is second to none with everything that a family could need. Thank you so much for continuing to stay with us and we look forward to having you back soon! Thank you so much for your feedback. We are so happy to hear that you enjoyed this home. It truly is an amazing one. We have let the property manager and home owner know about master bed so they can look into what needs to be done. We are also working with the neighbor and the construction crew regarding the noise next door, hoping that we can mitigate that as much as possible. We hope to see you all back again soon! Great place to stay right on the beach! Loved it! Nicely decorated, comfortable beds. The kids loved having the extra kitchen downstairs near their room and the pool table. We had a group of 12 and there was plenty of room for everyone. We had a wonderful stay! What a beautiful view! Thank you so much for choosing 360 Blue. We hope to see you back soon! Beautiful home, comfortable beds and plenty of space for everyone that came. Pool was great and a lot bigger than most beach pools! Great experience and would definitely rent again. Glad to see everyone having a splash in the pool! Thank you so much for staying with us in Miramar Beach at Casa Grande!